As the winter and festive season approaches, you’ll no doubt be starting to make plans to spend time with family and friends. If you’ve found yourself feeling stuck for gift ideas this year, what better way to treat your loved ones than with a gift you made yourself? If you’re planning a trip to West Sussex in the coming weeks, be sure to check out some of the local crafts and workshops to take home something truly unique. We’ve rounded up some of our top picks from around the county to get you started. The Artisan Bakehouse in Ashurst is one of our favourite places to get our hands stuck into making delicious and authentic artisan baked goods. It’s the perfect time of year to make some mouth-watering treats to take home to your family and friends, so why not have a go at their Christmas breads or festive macaron making workshops? The winter months call for evenings spent sharing a cheese board with friends, so why not take it a step further and make your own? Learn the art of cheese making from the High Weald Dairy farm experts and not only will you make your own fresh soft cheese and hard, cheddar-like cheese, you’ll enjoy a homemade lunch with a delicious tutored cheese tasting on the day too. Treat the person with a sweet tooth in your life to luxurious chocolates made by your own hands! From soft centres and truffles to sweets, bars and lollies, you’ll be sure to find a workshop in West Sussex that will delight your loves ones. Check out upcoming classes with Chocolatician in Shoreham-by-Sea or Le Salon Du Chocolat in Chichester. 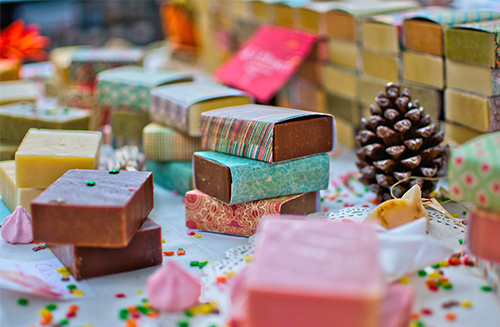 For something a little bit different, how about a therapeutic afternoon making handmade soap? Experiment with colours and fragrances to create unique and luxurious soaps for the perfect pampering gift. Have a look at some of the workshops coming up on the Goodwood Estate, near Chichester, including soap making and the art of scent mixing to create a bespoke home fragrance. Make a traditional festive wreath using plants, sprigs of berries and willow under the guidance of local experts that are passionate for all things natural. At the WWT Arundel Wetland Centre, herbalist Sheila will show you how to make your wreath with natural plants and willow whilst surrounded by the stunning surroundings of the wetland nature reserve. You can also join a Christmas wreath workshop at Wild Sussex – a truly quintessential West Sussex experience. Based in the heart of the South Downs, close to Pulborough, you’ll also have the opportunity to buy your Christmas tree locally, enjoy some wood and charcoal cooked seasonal produce and peruse an array of ethically-made crafts from local independent makers. Learn to craft as they did way back when with workshops at the Weald and Downland Living Museum near Chichester. From using a loom to weaving a yarn Christmas tree or creating a 2ft standing willow tree, to stained glass ornament painting and patchwork decorations, there are plenty of expert-led workshops for you to choose from. Not only will you come away with quirky gifts and decorations, you’ll have a deeper insight into some of our ancient crafting techniques. At Experience West Sussex, we love every opportunity to celebrate our county for its age-old crafts and traditions that have stood the test of time. If you’d like to receive more information on events like this, straight to your inbox, sign up to our newsletter. Plus, don’t forget you can share your West Sussex experiences with us on Facebook, Twitter and Instagram using the hashtag #ExperienceWestSussex! We’d love to see what crafty things you get up to this festive season.